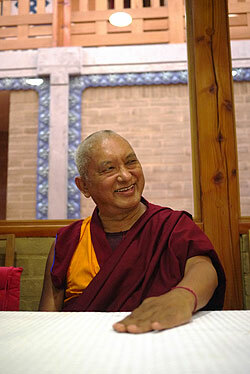 Lama Zopa Rinpoche relaxing at Nalanda Monastery, France, November 2011. Photo courtesy of Nalanda Monastery. Rinpoche is in India continuing rehabilitation after the stroke with ongoing help from Khadro-la and Tibetan doctors. 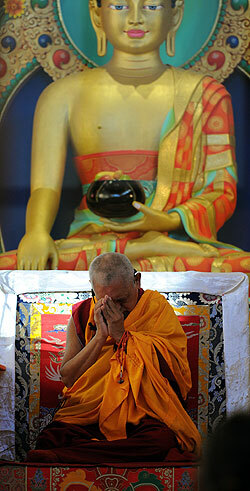 Lama Zopa Rinpoche in prayer, Nalanda Monastery, France, November 2011. “Although the letter writing may not be clear, please read it slowly. In the Southern Continent in particular, to the great Dharma king of three realms Lama Tsongkhapa’s unified pure refined gold-like teachings of sutra and tantra, not letting them degenerate through extensive hearing and contemplation, the perseverance, the extremely precious greatly kind objects of refuge – the assembly of oceans of learned Sangha community – I offer this letter of request. I, by the name of Thubten Zopa, am making a humble request to all of you, gathered here. Today is Thanksgiving Day in the United States of America. Thanksgiving was started over five hundred human years ago. It is celebrated by killing the bird that is known as a turkey, by so many people. This killing on this day is a bad tradition that is harmful for oneself and others. On Thanksgiving Day over 65 to 66 million birds (turkeys) are killed for the American people to eat. If one human being gets killed, then it is shown on television and newspapers, broadcast as widely as possible, and they spend so long to analyze the reason [for it]. But when an animal dies or gets killed, it seems the recognition is that it is just food to be killed and eaten. There is no thought and recognition that the animal is a sentient being – like us human beings – who also wants happiness and does not wish for suffering. It is very sad. Over 65 to 66 million turkeys are killed. I, on behalf of all the turkeys, request your prayers and protection. Please pray for them. Please guide them from the lower realms. I, representing all of them, make requests to you Sangha community upholding the teaching of Buddha, compassionately, to please help us the pitiful turkeys, who are now going through extremely terrifying fear and suffering in the lower realms. Please guide us to a buddha-field or lead us to attain birth with the eight freedoms and ten richnesses, so that from a very young age we are able to hear the precious teachings of Buddha, get ordained and meet a fully qualified Mahayana guru, thereby [causing] our body, speech and mind to never face any unpleasantness and negativities, but always find places of pleasantness and positivity, whereby we are able to enter Sera Je Monastery and train thoroughly in the principles of the common path (the three principle paths) and train in the uncommon path by receiving the four initiations that sow the seed of the four kayas thoroughly in the mental continuum [up to] and through the practice of generation stage (ripening the mind) and through the practice of completion stage (liberating the mind) and thereby attaining the resultant state of the union of holy body and mind with the precious union of seven-limb embracing, very quickly. I, from the core of my heart make this request with vast, profound and swift prayers and dedication to actualize this. Rinpoche also commented on Thanksgiving Day turkeys in November 2007. FPMT International Office is very sad to be saying au revoir to Merry Colony in her role as director of Education Services at the end of November. On behalf of so many, we offer our enormous THANKS to Merry for her commitment to FPMT education, and rejoice in all she achieved in her 11 years in the job, which includes (among numerous other projects) developing and delivering Discovering Buddhism, Basic Program, Masters Program and Living in the Path. These programs have benefited so many people and centers, and we cannot express enough our sincere heartfelt thanks for Merry’s tireless efforts. Please join us in welcoming Tom Truty as Education Services Coordinator. Tom has already been working in Education Services for six months and has gained an excellent understanding of its scope and responsibilities. He will now be overseeing all education projects and services, with support from Olga Planken as Masters and Basic Program Consultant, Kendall Magnussen working on Living in the Path and Eamon Walsh working on the Online Learning Center. Tom entered the FPMT Mandala through the Discovering Buddhism at Home program. He began volunteering with the Foundation Store a few years ago, before joining the Education Services Department. Discovering Buddhism: In an effort to help centers host the complete Discovering Buddhism program, answer keys have been added to the assessment questions for each module, making it easier than ever for the teacher to facilitate DB assessments. BACK IN STOCK! Vajrayogini Hand Mudras, DVD. Khensur Rinpoche Lama Lhundrup shows all the complex hand mudras for the Vajrayogini self-initiation. Note: while the subtitles are blurry and have uncorrectable typos, the content was too precious to not re-release. COMING SOON! Remembering Impermanence and Understanding What is True Dharma, DVD. 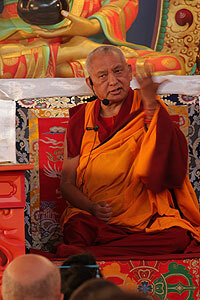 Lama Zopa Rinpoche teaching in Mongolia, 50 minutes and with English subtitles. NEW! Charity to Ants now available in e-reader format. NEW! Food Offering Practices, e-reader format. Includes Extensive Food Offering and Yogas of Eating According to Hinayana, Mahayana Sutra and Mahayana Tantra. 36 pages. BACK IN STOCK! King of Prayers in booklet and e-reader formats. Lama Zopa Rinpoche teaching at Nalanda Monastery, France, November 2011. We are absolutely delighted to announce that the number of FPMT Basic Program certificate holders has now reached one hundred! Andy Wistreich, senior English student and FPMT-registered teacher, is the 100th student to complete the requirements and receive the Basic Program certificate! Every year, thousands of dollars are donated to the International Merit Box Project by FPMT students, centers, projects and services worldwide, and disbursed through grants to eligible projects and initiatives. Since 2002, the project has disbursed more than US$725,000! We would like to send a heartfelt Thank You to all the coordinators and participants in this program of generosity! The International Merit Box Project for 2011 is drawing to a conclusion. Collections begin on Lama Tsongkhapa Day, December 20, 2011, and continue until March 31. Please see your options for ways to send in your offerings. If you aren’t currently participating in this wonderful program, there is still time! Visit the International Merit Box Project or email meritbox@fpmt.org for information. Over the past month Friends of FPMT has campaigned to welcome 500 new participants to the program by the end of the year. We are very happy to announce that more than 350 Friends responded to this appeal, 70% of our goal. Thank You to everyone: whether you became a Friend of FPMT, have been a Friend or supporter for some time, forwarded our emails, or simply generated a kind thought for our work. Your support means so much! Please rejoice in the latest news from the Amdo Eye Hospital! In September, Ven. Pemba (FPMT, Inc. board member and co-director and resident teacher of Cham-Tse-Ling in Hong Kong) visited the hospital to report on its progress and operations. Currently, there are 24 people working in the hospital, including four doctors and four nurses who visit from the local government hospital a few times a week to perform the actual surgeries. The hospital building is three and half stories high and has 36 beds. The inauguration of the building was in July 2010 and it took a year to equip the hospital and get the necessary documents to be able to perform the surgeries. In August 2011, the hospital officially opened to the public. In the first four weeks since opening, the hospital performed eight surgeries and four of these were offered for free. As the hospital becomes better known and receives more funding and equipment, it will be able to perform many more surgeries. Currently, the hospital is one of the largest hospitals in Xining dedicated solely to performing eye surgery. 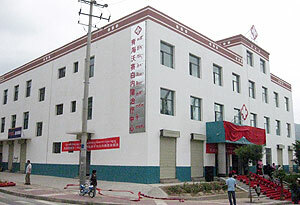 The immediate need for the hospital is to purchase a laser surgery machine (phacoemulsification machine). This will greatly help the hospital’s efficiency and will directly benefit those needing the surgeries. Thank you to all the kind benefactors who have helped to build the hospital and please do consider continuing to supporting this incredibly worthwhile project in whatever way possible. 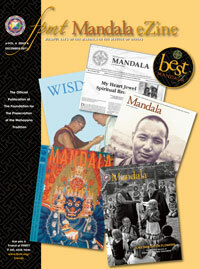 In the latest issue of the Mandala eZine, we visit Mandala‘s incredible archive of stories, bringing you another “Best of Mandala.” Highlights include a rare piece from the 1983 issue of Wisdom Magazine, Mandala‘s predecessor, which tells the story of Lama Yeshe’s return to Tibet in 1982 after 23 years of living in exile. In addition to our “Best of Mandala” stories, we offer an audio recording of Ven. René Feusi teaching at the June 2011 shiné retreat at Vajrapani Institute and a video excerpt from FPMT’s Discovering Buddhism program, featuring Ven. Karin Valham and Jan Willis discussing the nature of samsara. 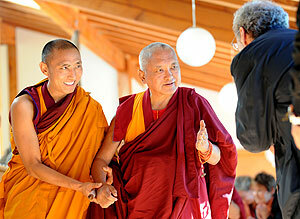 Lama Zopa Rinpoche greeting a student at Nalanda Monastery, France, November 2011. Rinpoche recently again expressed that he would like all FPMT centers, projects and services to recite the prayer Remembering the Kindness during group practices. This prayer was composed by Rinpoche in June 2011 to help us to remember the kindness of His Holiness the Dalai Lama and the Tibetan people. Rinpoche advised that this prayer should be used throughout the organization, recited following the Prayer that Spontaneously Fulfills All Wishes (Tong nyi nying je …) at the end of dedication prayers. We welcome our 13th new study group in 2011! An opportunity to offer service as director of De-Tong Ling, the unique retreat center on Kangaroo Island, Australia.